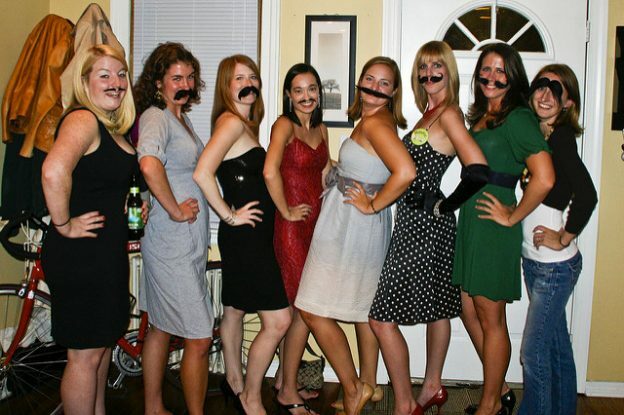 Halloween is just days away and throwing a mustache party is the easiest party theme out there! There are so many variations and styles available for Halloween or your October bachelorette party. This entry was posted in Bachelorette Decorations, Bachelorette Games, Bachelorette Party, Bachelorette Party Accessories, Bachelorette Party Cakes, Bachelorette Party Favors, Bachelorette Party Planning, Bachelorette Party Supplies, Bachelorette Party Themes, Party Planning and tagged bachelorette, bachelorette accessories, bachelorette decorations, bachelorette games, Bachelorette Party, bachelorette party favors, bachelorette party inspiration, bachelorette party supplies, bachelorette party theme, bachelorette planning, bachelorette superstore, party accessories, party theme on October 26, 2016 by Hype Girl. How much is too much? I ask this question on a regular basis due to my predilection for the exaggerated. A baking bachelorette party has risk factor but successful execution is engaging your friends while creating the nomz at the same time. This entry was posted in Bachelorette Party, Bachelorette Party Cakes, Bachelorette Party Favors, Bachelorette Party Invitations and tagged Bachelorette Party, bachelorette party favors, bachelorette party inspiration, bachelorette party supplies, bachelorette superstore on July 7, 2016 by Hype Girl. Bachelorette Parties don’t always have to have a reputation of being dirty. In fact, they can be quite sweet. Leave to to the Bachelorette Superstore to hook you up with the sweetest deals for a night out with the girls. This entry was posted in Bachelorette Party, Bachelorette Party Cakes, Bachelorette Party Themes on February 25, 2016 by Hype Girl. Valentine’s Day is built around romance, decadence, and most importantly; chocolate. Incorporate these scrumptious Valentine’s Day inspired deserts into your bachelorette party menu to delight your guests and create a romantic motif. This entry was posted in Bachelorette Party, Bachelorette Party Cakes, Bachelorette Party Supplies, Bachelorette Party Themes, Bridal Shower on January 19, 2016 by Hype Girl. Winter is filled with delicious seasonal desserts and flavors. Take advantage of the season and serve your own winter inspired desserts at your bachelorette party. This entry was posted in Bachelorette Party, Bachelorette Party Cakes, Bridal Shower, Party Planning on December 11, 2015 by Hype Girl. A well stocked and beautifully decorated dessert table is an inventive way to add a little extra style and culinary prowess to your bachelorette party. Whether the dishes are dirty or elegant, these sweet selections will be the hot topic of your event. This entry was posted in Bachelorette Party, Bachelorette Party Cakes on October 6, 2015 by Hype Girl. Bachelorette cupcakes can make excellent additions to all fun and spirited bachelorette parties. Cupcakes that are made for these types of celebrations are often funny and lighthearted in nature. They’re often topped with bright and memorable items such as glittery red or pink lips (sometimes in ring form), festive miniature champagne glasses and more. They’re sometimes even topped with items that are sure to make brides blush a little. The options in toppings for these kinds of cupcakes are practically endless. People often select toppings that they believe will make brides — and their close friends — smile and laugh. The goal of bachelorette cupcakes is to create memorable and fun experiences for brides prior to their wedding festivities. Although topping options for these types of cupcakes are extremely diverse and varied, the recipes are generally pretty classic and straightforward. 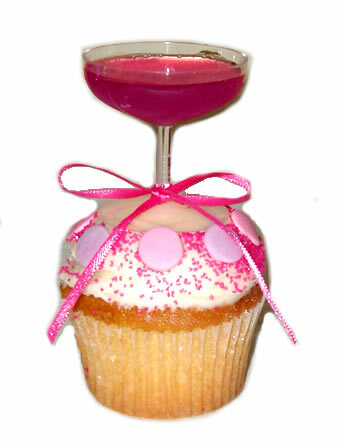 People frequently prepare all different kinds of cupcakes for bachelorette parties. Red velvet cupcakes are one popular example. Many people also make chocolate cupcakes with vanilla frosting or the direct opposite — yellow cakes with chocolate frosting. It always depends on the brides’ specific preferences and tastes, as there are no hard and fast rules. The color of the cupcake is often made to match the toppings. If a cupcake for a bachelorette party has a glittering hot pink pair of lips on top, then it may also feature bright pink frosting. This entry was posted in Bachelorette Party, Bachelorette Party Accessories, Bachelorette Party Cakes on August 6, 2015 by rachelle. Planning a bachelorette party is one of the most fun parts of being asked to be in a wedding. Whether it’s a whole night of fun on the town or just the bride’s closest girlfriends hanging out and having drinks until that mysterious cop knocks on the door, a bachelorette party is surely a special occasion to be commemorated. Friends involved in the planning might come up with a signature cocktail and a decor theme, but one of the most memorable parts of any special occasion is having the perfect cake. Choosing the cake for a bachelorette party is no easy task. It requires that someone know the bride’s taste in food very well, down to her favorite kind of cake and icing. From there, it’s all about choosing which friend is the best baker or picking a local bakery that everyone loves. Once the flavors are all set, then it’s time to choose colors. While you could match them to the colors of her wedding, it’s not necessary- the bachelorette party is a separate occasion entirely. A cake that’s pink, purple or even zebra print isn’t out of the question! This entry was posted in Bachelorette Party Cakes on July 17, 2015 by rachelle. Your wedding is supposed to be one of the biggest days of your life. That is why you can’t take this matter lightly. You have to go all out and that starts with having a crazy, exciting bachelorette party planned. Of course no bachelorette party is complete without bachelorette cake toppers. These items are exactly what’s needed to take your party to the next level. There are all different kinds of cake toppers you can choose from. 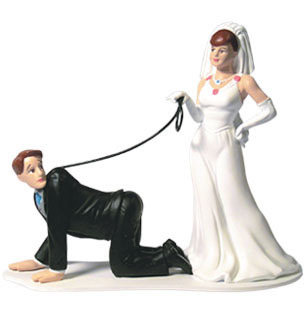 To name a few, there are the leash cake topper, glittery lips ring cupcake topper and the mini champagne glass topper. Whatever your preference is, there is bound to be a topper for you. This entry was posted in Bachelorette Party, Bachelorette Party Cakes, Bachelorette Party Supplies on February 1, 2015 by rachelle. For example, an elegant, classic style is to use ring-shaped cookie cutters. 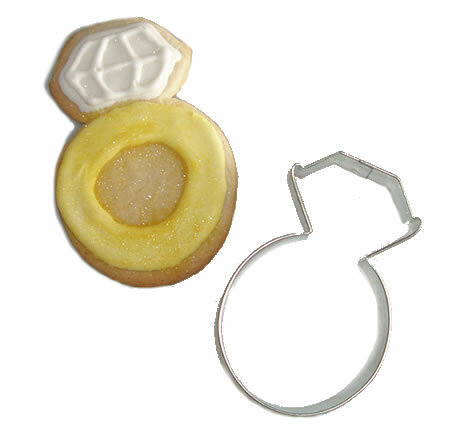 After you’re done baking the cookies, add icing of various colors depending on the style of the ring for cookies that are family-friendly. This entry was posted in Bachelorette Party, Bachelorette Party Cakes, Bachelorette Party Supplies on January 26, 2015 by rachelle.